Find out a wide range of waterproof portable testers, necessary to several application fields: agriculture, water and waste water treatment, hydroponics, aquaria, environmental monitoring, pools and thermal centers, food and beverage, cooling towers, galvanic industry, printing industry and education. In particular, measuring instruments are used in agriculture to monitor all water and soil parameters, in order to determine the best fertlizer ratio and irrigation cycles frequency. MULTI-PURPOSE METER: portable watertight instrument, multiparameter, for both pH and conductivity measuring, saving space, money, user-friendly. A single instrument, depending on models and sensors, can measure pH / mV / Conductivuty / TDS / Salinity / Temperature levels. Instruments can be equipped with cables from 1 to 5 meters long. PH-1 TESTER: portable waterproof instrument, IP 67. pH resolution 0,1 with microprocessor and fix sensor. Wide LCD screen. 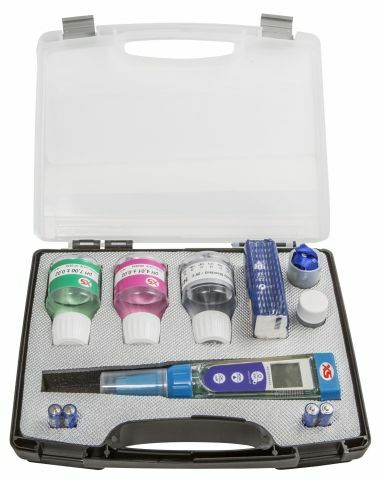 COMPLETE PH MEASURING KIT: portable waterptoof instrument, IP 67. pH resolution 0,1 with microprocessor and interchangeable electrode. Wide LCD display, three coloured. mV reading for pH electrode diagnosis, or for ORP sensor connection. Temperature sensor to measure product/solution temperature and compensate electrode response. Kit includes: bottle of 55 ml solution pH 7, bottle of 10 ml storage solution pH 4, calibration cup, strap, tissues, 4 batteries 1,5 V and suitcase. 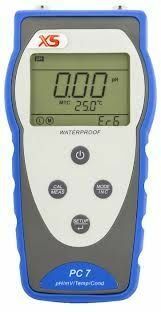 CONDUCTIVITY TESTER-1: portable waterproof conductivity tester, IP 67 for conductivity and TDS measuring. Automatic scale. With microprocessor and interchangeable electrode. Wide LCD display, three colours. One or two points calibration switch. COMPLETE EC-5 MEASURING KIT: portable waterproof conductivity tester for conductivity, TDS and salinity measurement. Automatic scale. With microprocessor and interchangeable electrode. Wide LCD display, three colours. Temperature sensor to measure product/solution temperature and compensate electrode response. 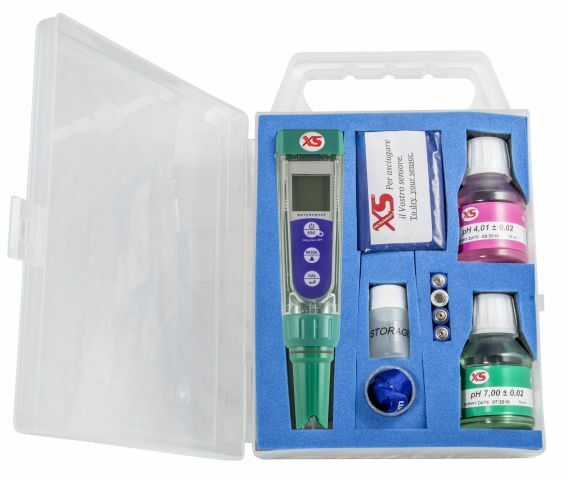 ​Kit includes: bottle of 55 ml standard solution 1413 µS and 12,88 mS, calibration cup, strap, tissues, 4 batteries 1,5 V and suitcase.